Of all the things in life I love coffee has been essential. If someone were to offer me the best cappuccino in the world or a million Dollars I would prefer the cappuccino. You see having been through rough times money is there when you have it and gone when it is spent. But a cappuccino bought with your least fiver is memorable. Despite that the title of this post implies something else. I drink more smoothies and juices these days. The last few months I have decreased my coffee consumption. From 5 or 4 espressos per day maximum I now stay at 2 per day maximum. 3 espressos if the day is really intensive. It used to be that a day without coffee would give me light headaches. After a few weeks of drinking less coffee days without coffee were without headaches. Yeah I was semi-addicted to the bean beverage from Ethiopia. What happens when you drink less coffee? In my case my appetite increased and I slept a bit better. That meant and means for me that I have to eat better and manage my energy more effectively. One addition I made to my diet was to drink more smoothies and juices. The fresher the better. 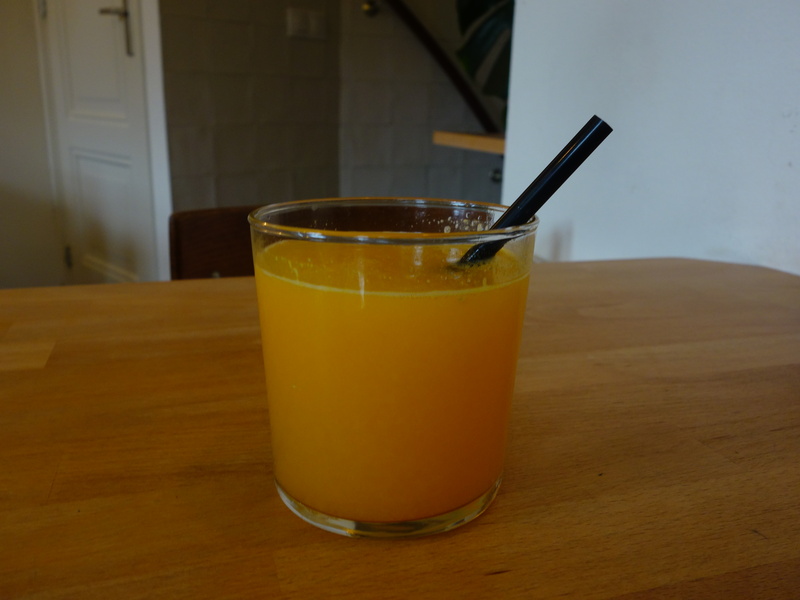 Fresh juice with its pulp is so full of flavour and natural sugars you can skip sweet snacks. I still drink coffee on days with long shifts but more sparingly. In between water and juice to stay hydrated. Preferably a good smoothie keeps me going. Once I made fresh juice for my work break. Oranges fresh from the store, cold pressed with pulp added in a 0.5 litre bottle. My colleague saw it and asked “is that soup?” I answered “That is fresh orange juice with pulp.” She was not used to real fresh juice which showed. Usually supermarkets sell juice from concentrated batches with little to no pulp with additives which looks thin. I refuse to buy that. If ever you think about drinking less coffee, skip one and get a good smoothie. Add a decent meal or healthy snack and you have more energy. P.S. I enjoy coffee even more now. I drink it more for its taste than before. Posted in Short Reads and tagged coffee, diet, energy, fresh, juice, life, pulp, smoothie on October 4, 2017 by rura88.